Creating a phase-resolved spectrum for a periodic source allows the user to compare the spectrum from different portions of the cycle and look for changes that may occur as the source rotates or orbits. This thread has been completely re-written. Previous versions of this thread used a different technique to filter the event file on PHASE that left the user to compute the correct exposure time. This new technique provides a way to filter the data using good time intervals (GTIs) so that the Datamodel can compute the exposure time automatically. This version of the thread also provides some guidance on how to determine the period. To create a phase-resolved spectrum for a source. A discussion on barycentric time corrections. Last Update: 23 Mar 2016 - Added a warning about REGION block with gratings data. 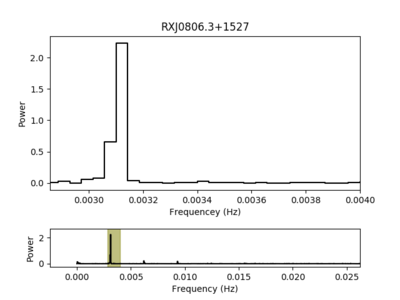 Figure 9: Spectrum for Phase 0.4:0.9 with 321.85 second period. Users should not fold a spectrum on a period that is close to or smaller than the temporal resolution of the data. The resolution is the TIMDEL value in the header of the event file. Users working with gratings data should pay extra attention to the dmcopy opt=all bug when working with TIME/GTI filters. For the remainder of this thread it is assumed that the data have been reprocessed using chandra_repro and that all the files have been copied into the current working directory. The Orbit Ephemeris file, orbitf121694700N001_eph1.fits, is included in the primary/ directory. Users with recently obtained datasets may only have access to the Level 0 ephemeris file (eph0.fits). This is the predicted ephemeris. The level 1 ephemeris (eph1.fits) is the definitive ephemeris which is generally available within about a month of the observation. The observation is a single CCD, 128 row subarray. Given the location of the source it could dither off the subarray for part of the observation. This can impart a 707 or 1000 second periodicity onto the data. Any frequencies comparable to the dither frequency should be highly scrutinized. Users can check for the source region dithering off the active part of the detector using the dither_region tool. The Determining Exposed Region Area thread provides examples of using dither_region as does the Search for Variability in a Source thread. Most ACIS observations are performed with dither period in pitch and yaw of 707.1 and 1000.0 seconds. For HRC the standard dither is performed with periods of 768.6 and 1087.0 seconds. The WebChaser Details page for an observation will contain the dither periods for any observation performed using non-standard dither parameters. The filtered version of the event file is used in the remainder of this thread. The times in the data products need to be corrected to barycenter following the applying a barycenter correction thread. This is to account for the difference in photon arrival times as Chandra orbits the Earth and the Earth moves around the Sun. This barycenter correction should precede any phase calculation when trying to align phase between observations. A summary of the steps in the thread are shown below. If the observation has multiple aspect solution files, this correction must be applied to each individually. The new ASOL file name is now added to the header of the event file so that later tools can automatically locate it. This file will be used to correctly align the good time intervals (GTIs) with ACIS exposure frame time boundaries. Users who know the period of their source can skip directly to the Compute Phase section of this thread. CIAO provides some tools to perform rudimentary timing analysis that can be used to determine the periodicity of a variable source. This section highlights those tools and provides some insight into how to interpret the outputs. which provide independent verification of the results presented here. 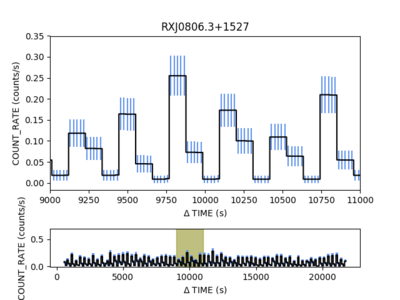 dmextract can be used to extract a light curve binned at a fixed time resolution. Below is an example using a bin size of 20 seconds. The output lightcurve is shown in Figure 2. Remember that the event file used here has already been filtered spatially and by energy range. Background has been ignored in this example due to the brightness of the source and the small region size. This lightcurve shows a strong periodic, what might be eclipsing, behavior. Users can learn more about lightcurves in the Basic Lightcurves thread. The choice of bin size can sometimes mask variability or accentuate artificial/instrumental frequencies. The next tool uses a Bayesian blocks approach to determine the optimal bin size. The glvary tool creates a probability weighted, optimally binned lightcurve using the Gregory-Loredo Bayesian blocks algorithm. The data are shown in Figure 3. The same range is highlighted as in Figure 2. Figure 3 closely resembles Figure 2. The glvary curve is more smooth since it is computed by summing probability weighted lightcurves at different resolutions. Users will also note that the curve does not go to zero which is a byproduct of the GL algorithm. The Search for Variability in a Source thread shows more examples of how to use the glvary tool. Having established that the source is periodic, attention now turns to determining the frequency. The standard approach to determine the frequency for a periodic signal is to compute the power spectrum (amplitude of the Fourier transform). 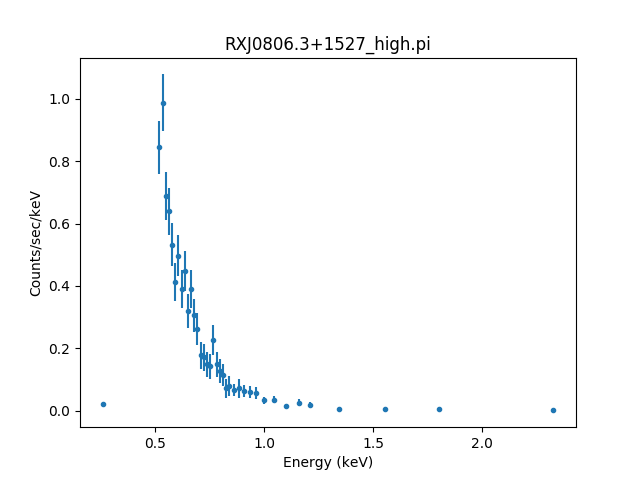 Users should in general be cautious when trying to interpret the power spectrum of a lightcurve for low count data; Poisson noise can easily mask faint signals. 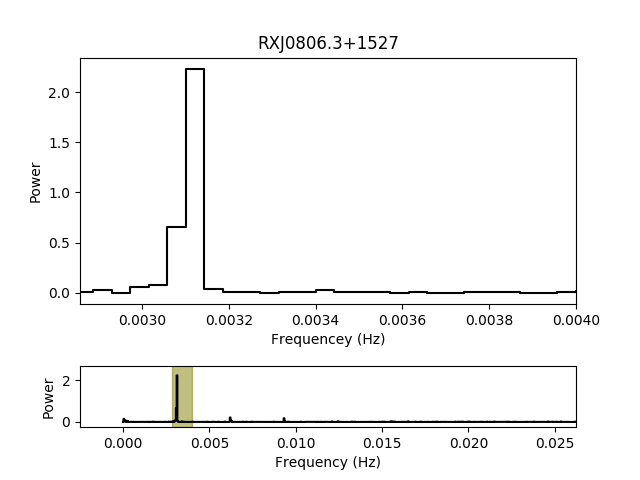 This dataset has a significant number of counts per bin so the power spectrum is meaningful. The dmextract lightcurve should be used to create the power spectrum as the glvary lightcurve has been too heavily processed. Also, although not a concern here, dmextract can produce a background subtracted lightcurve while glvary cannot (at least not directly). First, the mean count rate is subtracted from the lightcurve. This is to suppress the large, constant, spike at 0 frequency that can obscure low frequency components. Then the power spectrum is computed using the apowerspectrum tool. Since the lightcurve is entirely real valued, use infileimag=none. The output file is simply Frequency versus Power (amplitude of the Fourier transform). The data are shown in Figure 4. The power spectrum for the mean-subtracted lightcurve (Figure 2). The full range of frequencies upto the Nyquist frequency are show in the inset, with the main plot zoomed in on the dominate spike. The power peaks at a frequency between 0.00310 and 0.00314 Hz (period between 318.5 and 322.6 seconds). The chips command to make the plot are shown below. The power peaks at a frequency between 0.00310 and 0.00314 Hz (period between 318.5 and 322.6 seconds), with some higher frequency harmonics present. Those values agree well with the 321 second period reported in the literature. To provide a better estimate of the frequency using the power spectrum approach would require using a smaller bin size with dmextract. However, the bin size needs to be significantly larger than the native time resolution (TIMEDEL=0.44 seconds) to avoid aliasing effects so this is about at the practical limit for this dataset. 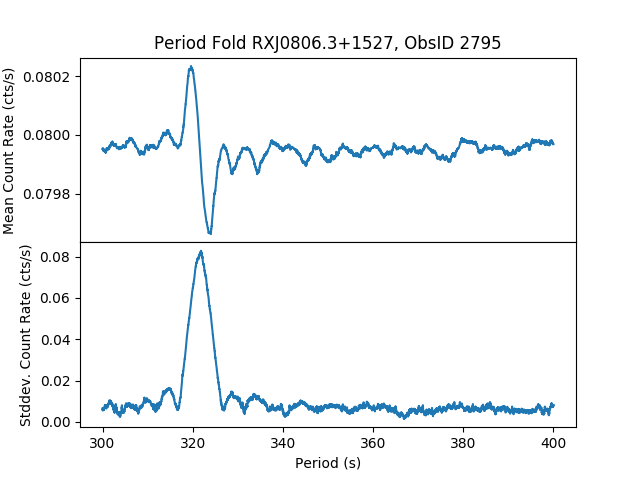 Another common approach to locate the frequency of a periodic signal is to perform period folding (may also be called epoch folding). This is performed with the pfold tool. Another way to refine the period is to search for periods in some specified range. The basic algorithm is to iterate over a grid of expected periods, create a phased-binned lightcurve for each period, and the locate which period shows the strongest deviation from a uniform/flat signal. Folding lowers the statistical uncertainty in the phase bins as the number of counts increase. There are various metrics that can be used to measure strongest, ie the L-statistic used in the SITAR package. pfold currently only outputs the standard deviation of the count rate, SIGMA_RATE, together with the average count rate MEAN_RATE. To ensure that all the products are phase aligned (using the same time offset for PHASE=0), the TSTART value from the event file header is explicitly being used. 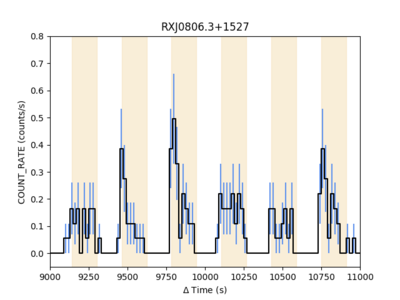 The power spectrum identified a periodic signal with a period of ~320 second, so a grid of times around that period will be searched. This example uses a very generous range of periods from 300 to 400 seconds with a step size of 0.01 seconds. 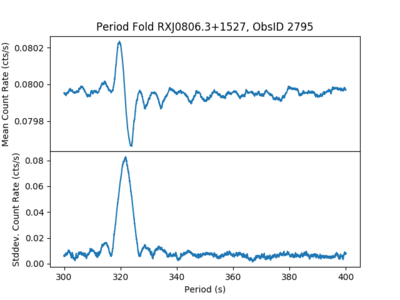 The pfold output contains the phase binned lightcurve (PHASE_MID vs. RATE) for each of the input periods. 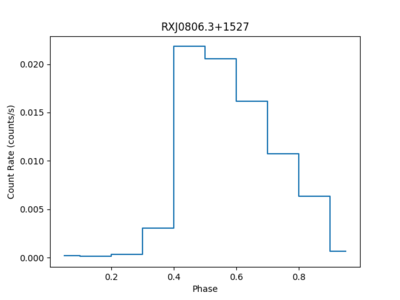 Additionally the MEAN_RATE (average count rate) and SIGMA_RATE (standard deviation of count rate values) is reported; these values shown in Figure 5. The peak in the SIGMA_RATE column occurs at a period of 321.85 seconds. The phase binned lightcurve for that period is shown in the Figure 5 inset. The pfold output for the MEAN_RATE (top) and SIGMA_RATE (bottom) verses period. The characteristic sinc (sin(x)/x) shape in the SIGMA_RATE curve is strongly indicative of periodic signal with frequency at the maximum (that is the maximum deviation from a flat/constant signal). The peak occurs at a period of 321.85 seconds. The inset plot shows the phase binned lightcurve at 321.85 seconds. Analysis of the pfold output shows that a period of 321.85 seconds should be used for to compute the PHASE. The pfold array columns can be converted into normal scalar arrays using the dmtype2split tool. While this tool is normally used to convert gratings type II PHA files into standard type I files, it can be used more generically to convert any file with array columns into scalar columns. This file format may be easier for other applications to use. In the previous section several types of analysis were performed to come to the conclusion that RXJ0806.3+1527 has a period of 321.85 seconds. This number will now be used to create a set of Good Time Intervals (GTIs) and to extract a spectra from the brightest part of the cycle. This thread will be using dmtcalc to compute the phase (fraction of the period) of times in various data products. dmtcalc can compute arbitrary expressions via its rich expression syntax. The leading dot (period) for the columns .period, .tzero, and .freq designate them as temporary columns which are not written to the output file. If the frequency was known, instead of the period, then the .freq column can be set directly. This is a problem because the TSTART value is different in different data products. Be sure to use the same tzero value with all the files. This dmtcalc.expr file can now be used as input to dmtcalc. First, the phase for the times in the event file are computed. This example bins the events into 10 phase bins (going from 0 to 1.0 in 0.1 (10%) period bins). Note that the data are not being binned on time, they are being binned on phase, so the output format must be set as op=generic, not op=ltc1. The phase binned lightcurve is shown in Figure 6. The phase binned lightcurve created with dmextract from the event files. Note the similarity to Figure 5 inset. The shape is the same however the normalization is different by an order of magnitude. While the shape of the curve is the same as the inset in Figure 5, we see that the COUNT_RATE is an order of magnitude lower. This is because the exposure time dmextract uses is the full length of the observation, instead of the per-phase-bin time. dmextract does not know that binning on PHASE implies a binning on TIME, nor does it know how to convert between the two. For things to work out correctly, any expression involving phase needs to be expressed differently; it must be expressed as a function of time. This will be done by creating Good Time Interval (GTIs). The correct way to filter/bin on phase is to convert PHASE into TIME. This will be accomplished using dmgti. The input to dmgti is a file with a TIME column. For phase binning the time resolution should be smaller than the time resolution of the event file. The aspect solution has a time resolution of 0.256 seconds which meets this need. First, the PHASE for the times in the barycenter corrected aspect file are computed using dmtcalc as was done earlier with the event file. dmgti uses the same mathematical expression syntax as dmtcalc. Examining the output there are 67 time intervals where the PHASE is within the specified range. The times in the high.gti file now correspond to times when the phase is between 0.4 and 0.9. The next step is to align those GTI time boundaries (start and stop times) to match with the start and stop times of the actual ACIS exposure times. (This step is not necessary when working with HRC data.) 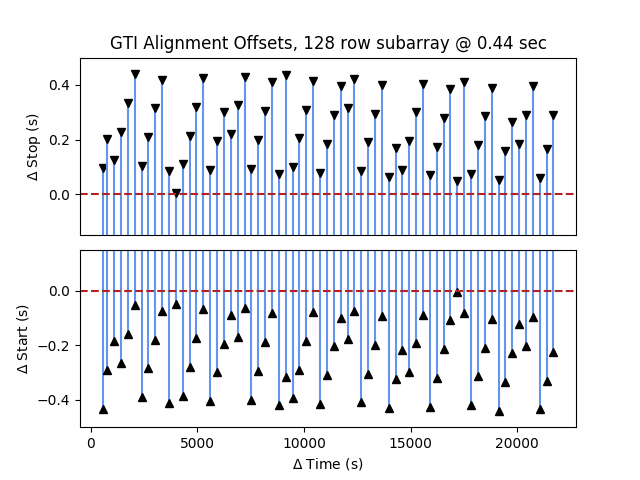 This is a small correction to each GTI, just a fraction of the frame time; however, with many GTIs the cumulative adjustment can become significant. 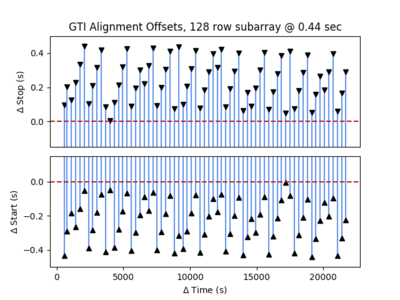 The gti_align script is used to adjust the arbitrary phase times. The script uses the exposure statistics file, stat1.fits, which is why the barycenter time corrected were also applied to it. Figure 7 shows a comparison of the GTI START and STOP times after the aligmnent. Since the frame time is approximately 0.44 seconds, the amount each GTI is shifted in either side is no more than 0.44 seconds. A thirty second difference in ONTIME is probably not significant for this observation. The effect, however, is cumulative. For other periodic sources with shorter periods, there will be more GTIs and the correction can become a significant fraction of the total exposure time. The GTIs can be inspected before extracting the spectra by plotting them on top of the lightcurve. Figure 8 shows the lightcurve in Figure 2; the good times are the times shaded intervals. The exposure frame time aligned GTIs shows on the zoomed in part of the lightcurve from Figure 2. The good times are the shaded time intervals. First, the event file is filtered with the GTI file. This is necessary to correctly set the EXPOSURE (and releated) keywords. Users working with gratings data should follow the work around in the dmcopy opt=all bug when working with TIME/GTI filters. Then specextract is used to extract the spectrum. Aspect solution file RXJ0806.3+1527_bary.asol found. Updating header of RXJ0806.3+1527_high.pi with RESPFILE and ANCRFILE keywords. Updating header of RXJ0806.3+1527_high_grp.pi with RESPFILE and ANCRFILE keywords. Even though the data have already been spatially filtered, specextract checks the infile for a spatial filter. Otherwise, applying the same filter twice has no effect. As before with the lightcurve, background has been ignored when extracting the spectrum. The spectrum can then be loaded into sherpa for modeling and fitting. The phase resolved spectrum is shown in Figure 9. 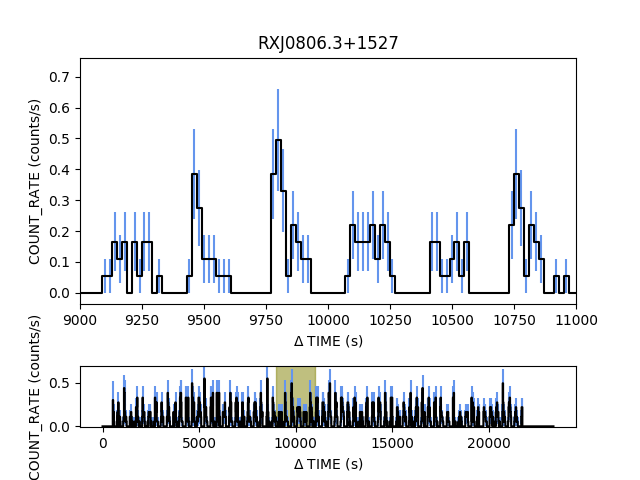 The spectrum for RXJ0806.3+1527 during the phase=0.4:0.9 interval of its 321.85 second periodicity. The data have been grouped to a minimum of 10 counts per channel. Users can now proceed directly to model and fit the data. Since the PHASE was selected via GTIs, the EXPOSURE time has automatically been recomputed. The spectrum can now be modeled and fit. 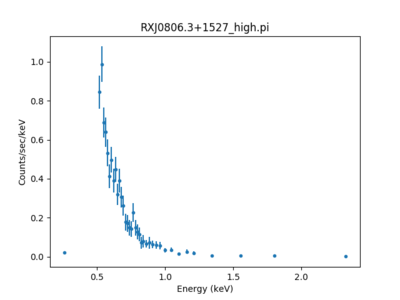 This thread analyzed the variable, periodic source RXJ0806.3+1527. The data products for the observation were barycenter corrected (axbary). Several timing tools were used to create lightcurves (dmextract and glvary) , search for variability (apowerspectrum), and determine the period of the variation (pfold). The period of 321.85 seconds agrees well with what is reported in the literature for this source in this observation. The data products were then phase folded using dmtcalc and a set of Good Time Intervals (GTIs) were created for the brightest part of the variation using dmgti. These GTIs were aligned to ACIS exposure frame time boundaries using the gti_align script. Finally these GTIs were used to filter the event file and specextract was used to extract the spectrum. 19 Jul 2010 the S-Lang syntax has been removed from this thread as it is not supported in CIAO 4.2 Sherpa v2. 03 Dec 2012 Review for CIAO 4.5. Added note about GTIs and link to pfold. 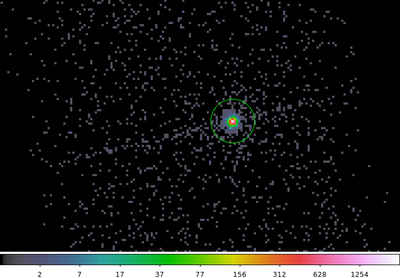 10 Dec 2013 Review for CIAO 4.6; added note about early data. 22 Dec 2014 Reviewed for CIAO 4.7; no changes. 13 Apr 2015 This thread has been completely rewritten. 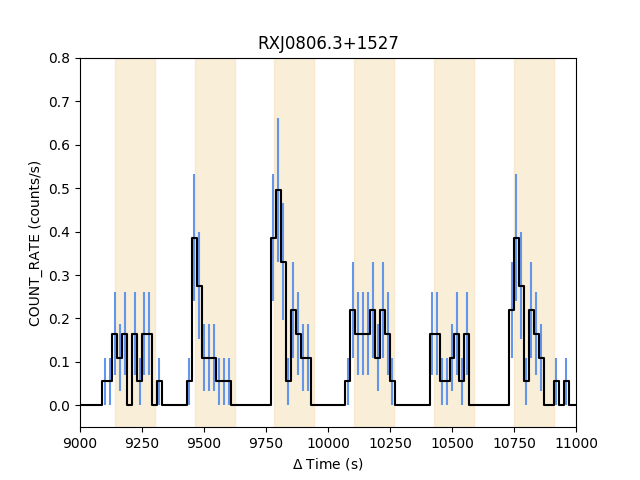 It now uses an approach that created good time intervals (GTIs) to filter the data and provides some guidance on how to determine the target period. This makes use of the new gti_align script. The bary center correction has been extended to include the aspect solution and the exposure statistics files. 11 Dec 2015 Updated for CIAO 4.8; removed work around in the axbary section. 23 Mar 2016 Added a warning about REGION block with gratings data.